Pam’s Pictorama Photo Post: Sometimes as a collector there is something that eludes you over a period of time. And sometimes as a spouse there is something from your partner’s former life that scratches at the back of your brain. This wonderful photograph managed to embody both for me. 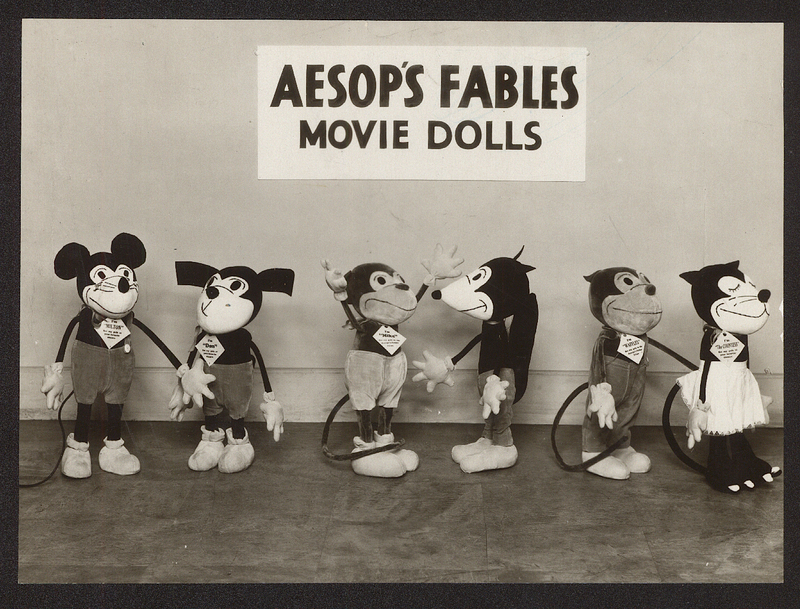 While I have used this photo in a previous blog post (Van Buerens Aesop Fables, the Toys) it was pulled off the internet, not my very own copy. It is the only publicity photo of these fairly rarified toys that I am aware of. (As you may know, I do have that rather sharp photo of Jane Withers holding one.) This one, for the record, is ever so slightly cropped, the serial number gone, probably the most notable difference. One of the important features of this photo is that each toy wears their name on a tag around their neck so those names are not lost to the sands of time: Milton (mouse), Don (dog), Mike (monkey), Raffles (or is it Waffles?) and The Countess. All except the wolf toy. What on earth could his name have been? I must research that. Meanwhile, years ago, as the story goes Kim was visiting a film collector (along with Leonard Maltin no less – this was of course in the days when film collector meant piles of film cans for those of you born in the post-DVD, streaming online era) and the fellow gave each of them a copy of this photo! Amazing! He evidently had a pile of them. So far so good, except my husband (who is a lovely and very unselfish fellow) gave it to his then girlfriend Sally. Now this was bound to stick in my craw both on the spouse side as well as irritate the heck out of me on the wife side even all these years later – it happened in 1980. Obviously I understand – I wasn’t even a twinkle in his eye for another fourteen years, and I was in fact, still quite underage and yet to embark on my years of toy collecting. Still, in my jealous wife and toy collectors brain this has remained a wrong that needed to be set right. Enter eBay last week – on a day when I had decided I really needed to rein in spending and behave for a while, but was having a little look nonetheless. There it was, mis-listed under Mickey Mouse photos and set as a buy-it-now for $25. Just in time for our wedding anniversary and our 20 year anniversary of our very first date. Bam! Mine! Oh bliss! The universe set right at long last.